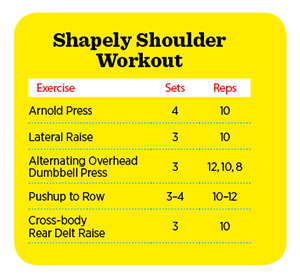 Spark new shoulder growth and define your rear delts with this finishing move. 1/ Lie on your right side on a flat bench holding a dumbbell in your left hand. Place your right hand on your left shoulder, keeping your head in line with your spine. 2/ Lower the dumbbell toward the floor, keeping your left elbow slightly bent. 3/ Squeeze your rear delt to raise the dumbbell straight up until your left arm is perpendicular to the floor. 4/ Hold briefly before slowly returning to start. Repeat for reps, then switch sides. Maintain a slight bend in your elbow throughout the full range of motion. Keep the movement slow and controlled when lowering the weight back to start. Raise your non­­working arm off the bench while performing the movement. Set an incline bench at 30–40 degrees to target the rear deltoids from a slightly different angle.